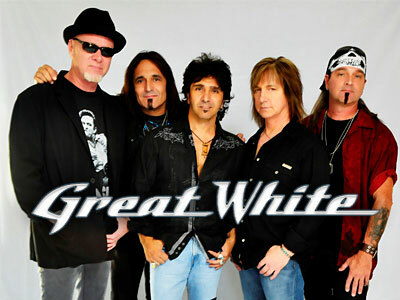 GREAT WHITE lead guitarist Mark Kendall, drummer Audie Desbrow and guitarist/keyboardist/backing vocalist Michael Lardie have fired back at the group's estranged singer, Jack Russell, after Jack filed a lawsuit against his former bandmates claiming that they kicked him out of the band and stole the group's name while he was recovering from surgery to repair a perforated bowel. Kendall, Desbrow and Lardie filed a 30-page counterclaim yesterday in a federal court in Los Angeles accusing their former frontman of, among other things, "miss[ing] 80 performances in 18 months" before leaving the band; "irreparably damag[ing]" their "market reputation" by putting on performances that "are not up to the standard of GREAT WHITE; and misleading the public by stating that the musicians in Jack's new band — which is performing under the name JACK RUSSELL'S GREAT WHITE — "were once full members of GREAT WHITE." They also accuse Russell's new bandmates of "profit[ing] from their wrongful affiliation with the GREAT WHITE brand." "Russell has stated that he was GREAT WHITE's creative director. In fact, [former manager] Alan Niven was the band's creative director from 1982-1995. He got the band signed to major label deals. Between 1985 and 1995, Niven wrote some of the music, most of the lyrics and, with Lardie (and sometimes Kendall), produced all the band's records. During this period, GREAT WHITE achieved its greatest commercial success. "At the height of his powers, Russell had a strong voice. He was noted for an ability to sing almost exactly like Robert Plant from LED ZEPPELIN. However, Russell never contributed substantially to songs or creative direction. He never learned to play guitar or piano. Sometimes during the final recording process he would suggest changes to vocal phrasing. Russell was often given a songwriting credit if he made any contribution at all, so as to maintain harmony within the band. "Russell's creative and songwriting contributions to the important albums were minor. For instance, the albums between 'Shot In The Dark' and 'Sail Away', contain 56 recordings. Russell was the sole lyricist on only 2 songs and had no role at all in 25 of them. He contributed almost no musical element. Russell relied on Niven to write the vast majority of the lyrics. The sounds and image of classic GREAT WHITE were created by the core of Kendall, Lardie and Niven. "By 2000, Russell's voice had deteriorated. Unable to perform adequately for an upcoming European tour, Russell suggested that the band play to pre-recorded music and lip sync entire concerts. Kendall adamantly refused and took a leave of absence from the band. Desbrow was strongly opposed to this idea. Lardie was cajoled into arranging a lip synced performance to avoid lawsuits by European promoters. "The first show of Russell's lip syncing tour was in Spain. By the third song, the audience realized the band was not playing live and began heckling the band. Most of the crowd left the venue. Russell insisted that the band press on with the tour, but the band members refused and returned to the United States immediately. "On December 5th, 2006, at Russell's birthday party following a release from the Betty Ford Clinic, [veteran music manager Obi] Steinman arranged a reunion of GREAT WHITE. A reunion tour was orchestrated for 2007, featuring Russell, Kendall, Desbrow, Lardie and bassist Sean McNabb. "Desbrow, Lardie and McNabb conditioned the reunion on Steinman and Sharon Gilday (the band's business manager) staying in charge of earnings, revenue splits and disbursements. The band would be equal partners and all profits and equity would be split equally. "All decisions would be made by democratic vote of Russell, Debrow, Kendall and Lardie, with Steinman having the deciding vote to end any disagreements. "No one member could use the name GREAT WHITE. If anyone was voted out of the band, it had to be by majority, with that member keeping royalties earned prior to termination, with no future rights in the name. "A European tour started on January 25, 2008 in Copenhagen, and the band was concerned that Russell may be looking for drugs after shows. His performances were substandard, and he appeared to not be sleeping. "On February 8, 2008 while in Prattlein, Switzerland, Russell went to a physician and received the drug Halcion. Later that day, Desbrow and Lardie found him barely coherent and wandering the street. "By April of 2008, Russell's personal life began to unravel. His fiancee broke off their engagement. On information and belief, he was told to leave her house because of drug use. "Beginning in 2009, Russell's health began to decline rapidly. On information and belief, the years of alcohol and drug use were beginning to take a serious toll, and he escalated his use of opiates and painkillers. "On information and belief, Russell had abused the steroid prednisone, which is often used by singers who have colds or are unable to sing in the upper registers. On information and belief, one of the symptoms of prednisone abuse is a weakening of bone and degeneration of muscle. "After a series of embarrassing incidents, Steinman, Kendall, Lardie and Desbrow again decided to limit touring. GREAT WHITE would only play a few shows a month. Russell was furious, because, on information and belief, he needed the money. He begged to go back on the road. "On May 23, 2009, in Parker, Arizona, Russell fell on stage. On information and belief, Russell's pelvis or hip was broken or fractured as a result of the fall. "On July 12, 2009, at a festival in Oklahoma called 'Rocklahoma,' a physician was called in because Russell was doing poorly. The physician recommended that Russell enter a detox program in California and gave him several Vicodin for the following 24 hours. On information and belief, Russell took all of the Vicodin at once and delivered a very substandard performance that hurt the GREAT WHITE name further. "A horrible fall took place on or about December 9, 2009 at the Cher-Ae Heights Casino in Northern California. Russell even predicted before the show that he may fall, and he did. On information and belief, his weakened bones resulted in a minor fall becoming a broken femur. On information and belief, Russell had taken such a high dose of pain killers that he did not realize the extent of the injury until after the show. "He soon required a stool on stage. "In January 2010, Russell fell asleep while driving and drove under a semi truck. The entire top of his car was shorn off. "In March, 2010, Russell was cited for driving under the influence. He cannot tour China, Japan or Canada with a DUI conviction. "Later, in 2010, in an infamous video filmed by a fan in San Antonio, Russell fell from a stool during the opening minutes of a concert. On the video, he was so incapacitated that he was unable to pull himself back up and required the assistance of a stage hand. "The video of the fall in San Antonio circulated quickly on the Internet. Kendall and the other members of the band were criticized for not helping Russell, even though it was that Russell insisted on taking these dates and performing to make money. "On or about August 10, 2010, after returning on a flight from Rapid City, South Dakota, Russell went to the hospital, where it was discovered that he had a perforated bowel. He needed immediate surgery. On information and belief, the years of steroid and drug abuse had made Russell's organs thin and vulnerable. "As of August 28, 2010, Russell was unable to perform. He would go on to spend the entire year of 2011 recuperating. "Terry Illous of the band XYZ was hired to save dates that were booked. Russell knew about him. He did nine shows, then GREAT WHITE played a few shows with Jani Lane, the former singer of WARRANT. This arrangement was suggested by the band's manager, who also managed Lane and was a friend. It was not suggested by Russell, though Russell had full knowledge that another singer was fronting the GREAT WHITE band, and he encouraged it. "GREAT WHITE played one show in Sweden with Paul Shortino as the vocalist. "Most consistently, GREAT WHITE played with Terry Illous, who is now the singer for the band. Illous's voice works very well with the band's music. He engages the crowd and was mobile on stage. Again, Russell knew that another singer was playing with GREAT WHITE for over a year, and that the band continued to bill itself as GREAT WHITE. Russell was not policing the GREAT WHITE brand. "Russell stated in January 2011 that he wanted to return by April 21, 2011 for some shows in Alaska. He did not make that date. "The next promised return date was May 12, 2011 in Columbia, Maryland. On information and belief, this date was pushed back because Russell did not maintain sobriety. "The next possible return date was in June, 2011. Steinman and the booking agent spoke with Russell and his wife. They stated their concern that if Russell could not make June, then September would be best because of a heavy schedule in August and July, including stints of playing three nights in a row. "In June, 2011, Russell fell and broke his leg, requiring more surgery and rehab. He later admitted to Steinman that he had been drinking and taking Xanax. On information and belief, Russell was supposed to be taking Suboxone to curb his opiate and methadone use. Steinman told Russell he could not support Russell's return to the band if he was not sober. "For a brief period in the summer of 2011, Russell seemed sober and lucid. Ms. Kendall informed her husband, who called Russell immediately. Kendall could tell that Russell was not impaired. He pushed Russell to call him every day at 9:30 a.m. Kendall vowed to help Russell stay sober, literally one day at a time, if he would make that call. Those calls lasted only three days. "On or about July 3, 2011, Russell wrote an email to Steinman stating 'If the band does not want me back, don't worry I will not go out with JACK RUSSELL'S GREAT WHITE.' He also promised that he was sober. "On August 11, 2011, Russell had a final abdominal surgery. It was decided he needed 8 weeks of therapy to gain his strength to perform. During meetings in September and October, February, 2012 was picked as the return date for Russell. "Meanwhile, the band played over 80 shows with Terry Illous. Promoters were instructed to use new photos of the band so that audiences would not believe Russell was performing. The shows were well attended and received positive reviews. "During this time, the band was not ignoring Russell. Th ey were keeping up on his progress through their manager Steinman, booking agent Sullivan [D. Bigg] and sometimes through Russell's periodic calls to Kendall's wife. Steinman had several text messages from Russell's wife. "The band had grown tired of the promises for return. They wanted to see results, which meant that Russell would be in the studio strengthening his voice with Lardie, not using a walker and producing clean urine samples. Anything less meant he was unable to return to touring. "In the fall of 2011, Russell represented that he was off all pain medication except non-narcotic medications and anti-inflammatories. He had Thanksgiving dinner at the home of his booking agent (whom Russell has now sued). He called the other band members and was slurring his words. "On December 7, Steinman, the booking agent and Russell decided that further physical rehabilitation would be necessary for Russell would return in February, 2012. He would work in the studio with Lardie in January, 2012. "Sometime in early December, 2011, Russell told Ms. Kendall that he would 'take his band name and leave.' When Kendall found out that Russell intended to use the GREAT WHITE mark without the band, he called an attorney who informed him that he was well within his rights to apply with the United States Patent and Trademark Office for a trademark registration on GREAT WHITE. "On December 7, 2011, Kendall filed for the trademark registration on GREAT WHITE on behalf of himself, Lardie and Desbrow. "On information and belief, Russell, through his attorney, independently attempted to file for a trademark registration on GREAT WHITE a few days later. On information and belief, Russell was surprised to learn that Kendall had already filed an application. "On December 8, Russell went to a new physician who said February, 2012 was possible for a return date, but Russell needed to get back into physical therapy. Russell also told Steinman that he was back on methadone. Steinman was concerned and told Russell about other drugs. On information and belief, Russell's wife was also concerned that he was on methadone. "On or about December 10, 2011, Russell wrote a letter to the band, stating that he would come back drug free and accusing band members of various wrongdoings. "On or about December 11, 2011, Russell sent a long, bizarre email to the band. He claimed to have had an affair with Kendall's wife and to have smoked crack cocaine with her. Kendall and Ms. Kendall were deeply disturbed by the email. He attacked each member as being talentless. He later retracted the entire message. "Russell then began performing as 'JACK RUSSELL'S GREAT WHITE.' His band includes Counterdefendants Johnson, Seixas, Lochner and Pontier, playing before a back drop where 'Jack Russell's' is hardly legible over 'Great White.' Russell began playing with the new band in January, 2012. "Russell's new band contains members that he had circulated through his solo band or were in GREAT WHITE only briefly. On information and belief, the public is misled by statements that these members were once full members of GREAT WHITE. "Russell's current performances are not up to the standard of GREAT WHITE. His singing is consistently flat, and his performances are damaging the GREAT WHITE mark. "After Russell left, GREAT WHITE began recording with Terry Illous. They decided to record an entire album, entitled 'Elation'. On information and belief, Russell has submitted new material to various labels, and has received little interest. "Russell has also stated that he will seek a preliminary injunction to stop the release of 'Elation', currently set for May 18, 2012, on Italian label Frontiers Records. His attorney has written a letter to Frontiers Records, claiming that Russell will 'most certainly' win this case."